Your generosity is a vital part of our fundraising efforts. Donations to the Komen Ride for the Cure are tax-deductible and support local breast cancer education, screening and treatment programs right here in our community. Donate to a Participant: It’s easy to make a donation directly to a Ride participant. Click HERE to search for a participant and donate now. Where Does the Money Go? 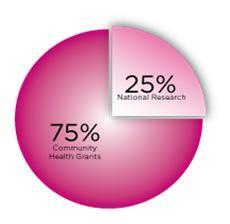 Up to 75% of the net proceeds raised through the Komen Ride for the Cure stays right here in our community to fund breast cancer programs and at least 25% supports Susan G. Komen’s national grants program to fund research. PLEASE help us track your donations and thank those for their generous gifts by attaching a Fundraising Form to your mailed donations, which you can find by clicking here.